An average Grass lawn can use up to 5000 gallons per month! Imagine the savings of not watering again! 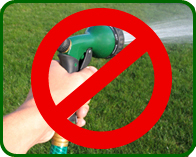 With water prices always going up you can rest assured your not going to pay more and more for watering. Or the maintenance costs of irrigation systems like computer timers, valves replacement, sprinklers, breaks in lines etc. NO MORE! Imagine having a consistently beautiful yard with no annoying mowing and edging, Just the perfect looking grass 365 days a year. All previous customers appreciate how much time and money this saves!